This is a sponsored post by Nomad Kite Events. Visit them here for more info. All text and images in this article © Nomad Kite Events and used with permission. Beginner Kitesurfing Lessons with Gogo at Nomad Kite Events, El Gouna. I’m Amber – an El Gouna local since not too long ago! 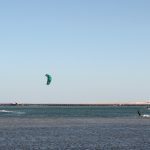 I recently decided to take up kitesurfing and took my first few lessons here in Egypt, but I was curious to find out more about learning here in El Gouna and what other travellers could expect. I met up with Martina and Gogo; the owners of a mobile kitesurfing company in El Gouna. Whilst with the pair they gave me some amazing insights into this family friendly spot and I am looking forward to sharing them with you all. Amber: Hey guys, thanks for joining me today! As you know I am just beginning to learn how to kite and I have so many questions for you. Gogo: Thank’s for coming, it’s great to see you again! Amber: You too! So you guys are the owners of Nomad Kite Events in El Gouna right? Martina: That’s right. Before “Nomad Kite Events”, we used to run our own kite centre “Surfvibes”, if you’ve ever heard about it? This was back before the Egyptian revolution and as you know Egypt’s tourism has had some rough patches, so we decided to close it. But once we started to see things improve and tourism finally returning, we decided to reopen under a new name “Nomad Kite Events”. This was about 1.5 years ago. Martina and Gogo from Nomad Kite Events hanging out on the water in El Gouna. Amber: Okay, cool. So I am curious, where did you guys come up with the name Nomad Kite Events? What does it mean? Gogo: Actually we decided to change the name to Nomad Kite Events as our business model changed a bit from before. Instead of running a complete centre on our own, we are now operating out of other centres as a mobile kite school. Like this we have the freedom to choose the best spots and centres wherever we go. As for the name, a nomad is someone with no settled home, moving from place to place, which kind of describes us pretty well… Kitesurfing nomads doing kitesurfing events. So how long have you both been kiting for? Gogo: I started as a kitesurfing beach assistant in 2006. My real goal was to learn kitesurfing and become an instructor. I was free to use the equipment of the school where I was working, but I didn’t have any instructor to teach me so I decided to learn on my own. That probably wasn’t the right way and I wouldn’t recommend anyone tries teaching themselves. Gogo: (Laughs) It can be dangerous if you don’t know how to do things safely and it took so long. Look, I made so many mistakes, had to re-learn things later down the line, got a few minor injuries and I struggled when I didn’t really need to. I don’t regret it. Now I know how my students are sometimes feeling. I understand the struggles my students have, and it made me a better instructor. Amber: That makes sense. How about you Martina? Martina: I had never seen a kite in my life until I travelled to El Gouna for a holiday in 2008. There were a lot of kites flying on the beach and I remember thinking it was so beautiful and fascinating. It also looked difficult, so I never thought to try it, as sports have never really been my thing. I just assumed that it was the kind of thing sporty people did. Not me! Then, luckily, I met with Gogo, who was at this point a kite instructor and the rest is history. 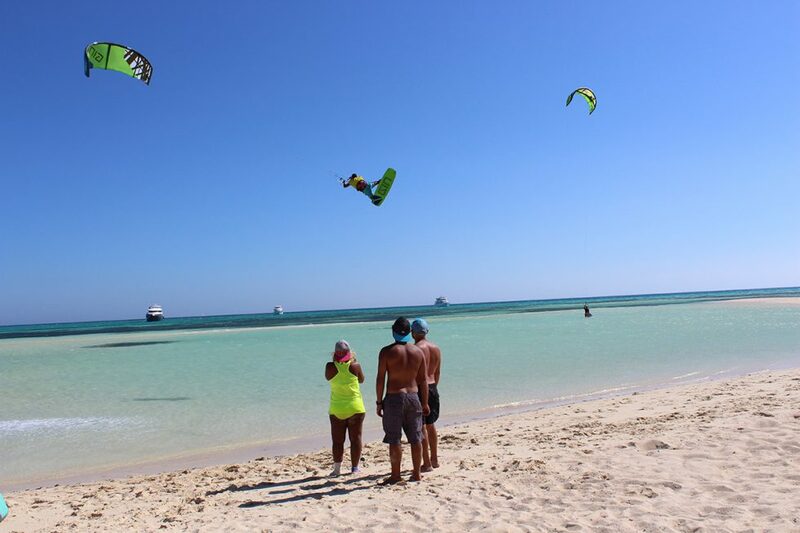 Day trips and Kite Safari’s to Tawila Island; one of Egypt’s most famous kitesurfing spots. Amber: You’ve both been kiting for years! I’m guessing you’ve been kiting in some interesting spots! What made you choose to set up in El Gouna? Gogo: I’ve been working in almost every place in Egypt and seen some amazing kite spots, but nothing compares to El Gouna. It’s very clean and it has a high standard. You know some call it “the Venice of Egypt” because of its lagoons and small bridges. Martina: (smiles) haha yeah, I have heard that one too. El Gouna really does have it all. 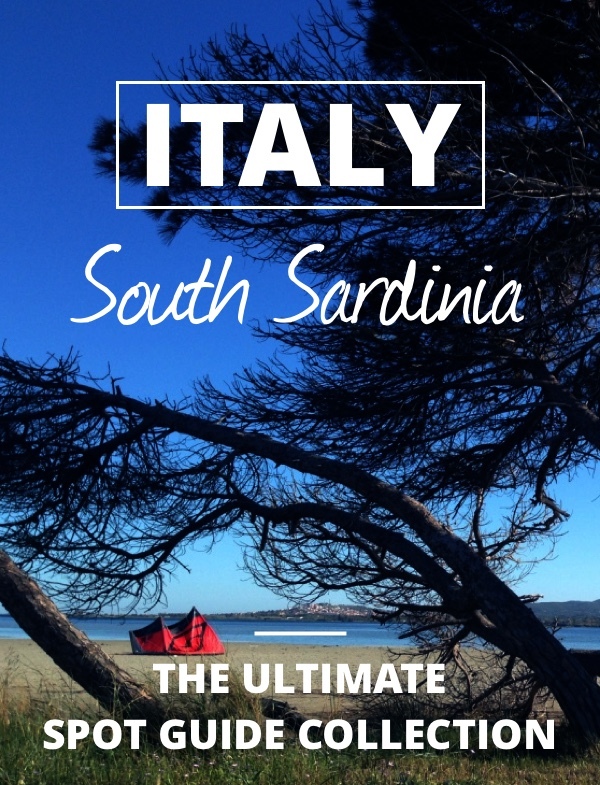 It’s close to the airport, the town has everything you need, it’s extremely safe, the wind conditions are perfect for kiting and there’s flat and shallow waters. You just don’t find all of this in one spot elsewhere. It’s a unique city and people from all over the world choose to travel and stay here. Amber: It is beautiful here. If you are coming from outside of Egypt, the nearest airport to fly into is Hurghada. How far away from Hurghada is El Gouna? Martina: El Gouna is about a 30 min drive from Hurghada airport. There are Taxi’s right outside the door if you really need one. Honestly though, transfers can be a bit of a hassle if you don’t have one arranged before you arrive. We try to make it easier for the guests that book with us and help them to make transfer arrangements before they get here and for guest who come on our six day events we decided to include the transfers as well. Gogo: It’s nice being close to Hurghada, it makes it easy when we get the urge to soak up some local life, visit friends or take guests to do and see something a bit different. Amber: How easy is it to get around the city? Gogo: It’s very easy! Everywhere you will find tuk tuk’s to drive you to any location in El Gouna. It costs about 1 euro per person. There’s also taxi services and shuttle busses. Martina: A little tip: try to carry small local currency on you so that you have the correct money if you want to get a tuk-tuk. You’ll find that they won’t always have the correct change. If you find any driver that you like particularly you can also ask for his number and have him to pick you up every day. There’s also UBER tuk tuk’s that work in the same way as the UBER taxi. Amber: What about accommodation? Are there many hotels to choose from? 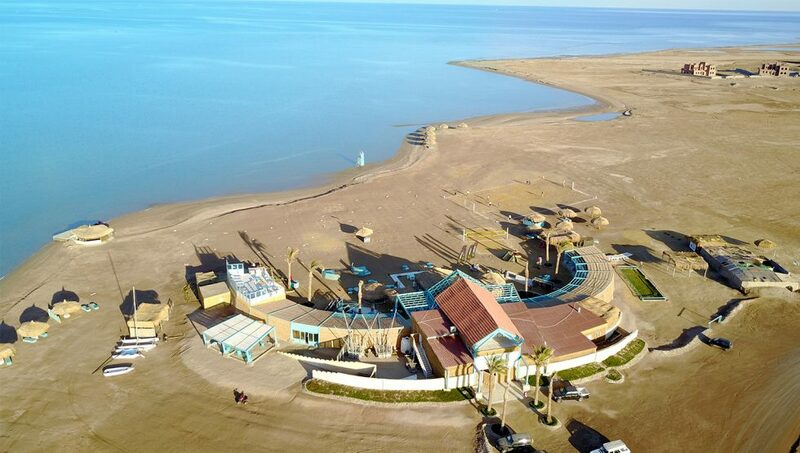 Martina: El Gouna is growing every year! There is already over 18 hotels to choose from and Airbnb is getting popular as well. Another tip I’d give to anyone thinking to travel here is to watch out for local holidays and events before you set your dates. The city can get really crowded and hotel rates are sometimes doubled. If you’re on a budget I’d avoid holidays such as Eid, New Years, Easter and big events like the El Gouna Film festival. Up and riding independently after Nomad Kite Events 6 day event! Amber: There’s plenty of places to choose from then. Let’s talk kite, what is there to learn beyond getting up on the board? Do you just teach beginners to get people riding or is there stuff for more experienced riders too? Martina: We do a lot of everything! Kitesurfing lessons, coaching for intermediate and advanced riders; helping them to learn new tricks and stuff. We also provide private lessons, kids’ lessons, six-day events, day trips to the islands and weeklong kite safaris. (pauses) I think that is everything. Gogo: Yeah and you never really stop learning. You just work on getting better, enjoying your riding and improving your skills. Amber: How many kite centres are there in El Gouna? Gogo: El Gouna has at least eight centres running now. Some of them are inside the hotels and some are along the Mangroovy beach. Amber: So which centre does Nomad Kite Events use? Martina: Well, now you will find us operating out of Element Watersports located at the end of Mangroovy beach but every centre here is different. For us the most important thing is that the centre has a big lagoon with enough room on the water for everyone. An overcrowded spot is a no-go for us. A big plus is the shallow water which makes it easier for our students to learn. 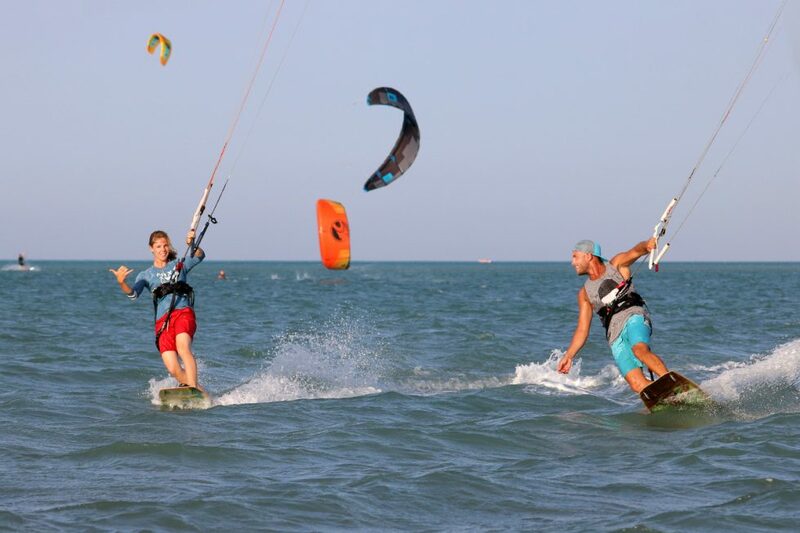 Gogo: One problem for kite surfing in El Gouna during the summer is the tides. It can leave many of the kite schools without water for a couple of hours during low tide. We are lucky because Element is one of the few centres with water even during low tide. Martina: The centre is very well equipped too. There’s a nice kid’s area, a great restaurant, other activities like beach volley ball, table football and table tennis. It helps that the staff are friendly as well. It’s a relaxed atmosphere and the team here are welcoming but at the same time professional. So, until we find a better centre to operate from you will find us at Elements. Aerial View of Element Watersports on a ‘no wind’ Day! Amber: I’ve noticed there are a few different languages bounding around here. Which languages do the staff and instructors teach in? Gogo: Our customers come from all over the world and our instructors can teach in several languages, so we made sure we were in an international centre where our guest would feel comfortable too. Some of the centres in El Gouna however are designed and run for people of particular nationalities. So, their instructors and staff mainly speak the languages from the countries they serve. Amber: Sounds like El Gouna is a popular kite spot for people traveling from all over the world! Martina: Egypt has always been a top destination for kitesurfing, it’s just sad that the political situation scared a lot of the tourists away. It’s perfectly safe, even during the revolution we didn’t see any trouble where we are! El Gouna is safer than any big capital in Europe. It even has its own security team that looks after everything here and they monitor everybody coming in and out of the city each day. I don’t think there are many other destinations where that happens. Intermediate and advanced coaching with Gogo at Nomad Kite Events. Amber: What would you say is the best time of year to kite here? 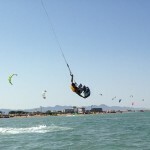 Gogo: Kitesurfing in El Gouna is all year round. From May to October this area is famous for constant and reliable wind; like a clock! Winter season is less predictable; it can be extremely good with over 20 knots or nothing at all. It is a bit riskier to come in the winter but on the other hand there’s so many other things you can do in El Gouna, you wouldn’t have a wasted trip. Amber: What else is there to do here? Gogo: Lots of stuff. For days when there is no wind you can still practice some skills at the cable park. Otherwise there’s stand up paddling, scuba diving, quad biking, boat trips, snorkelling, mountain hiking, horse riding…. there is even golf courses and places to play tennis and squash. Or you can just hang out at the beach, go for a swim or top up your tan. Martina: Some of our guests that like travelling, take day trips or a couple of days out to visit Hurghada, Luxor or Cairo, to see some of Egypt’s famous sights. There are some activities that we can even manage to get a little bit of a discount on for our guests which helps too. Bring your kids along to learn too! The perfect family friendly spot! Amber: That sounds like fun! So, what are the temperatures like throughout the year? Gogo: Our summer is hot of course but most tourists are surprised that it’s not as hot as they expected. Temperatures throughout the year are between something like 18 to 40 degrees Celsius. 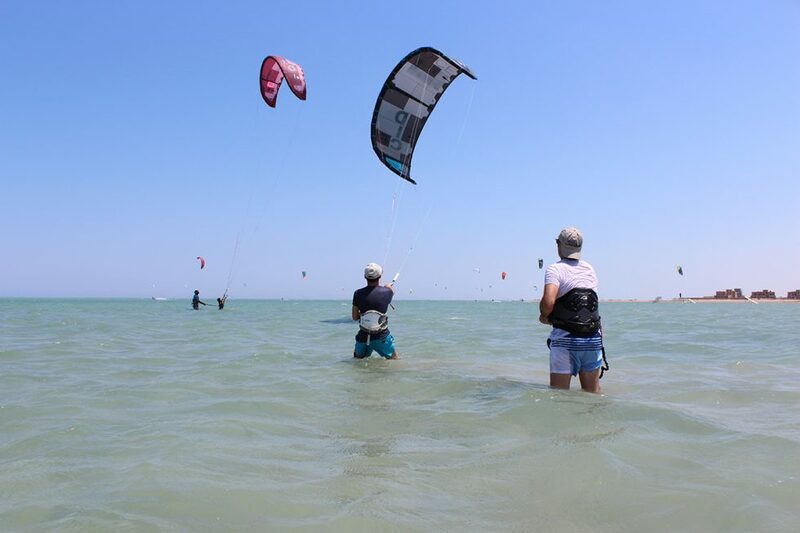 Martina: I know some people are afraid to travel to Egypt between July and August for example, but the summer months are normally extremely good for kiting. With the sea to cool you down and the breeze it’s not so bad and you’ll find plenty of shade in the centres. Some of our friends when they visit say they sleep better here in the Summer with the air conditioning than they do back home. The humidity is different here too, it’s very dry and so even when the temperatures reach their highest, it doesn’t feel as hot as it would in some other parts of the world. Amber: There are a lot of kiters playing around out on the water here today! Is this spot good for beginner riders too? Gogo: Yes definitely! 95% of the year we have a perfect side-shore wind, warm flat waist-deep water with a sandy bottom which is ideal for all riders, beginners or advanced. Amber: I took a family dive trip with my kids recently and one of the places we visited was a beautiful island called Tawila! Honestly it was amazing to see; sandy, shallow waters, mangroves and we even saw dolphins, but I was surprised to see so many kiters out there. Do you ever get to visit Tawila with your guests? 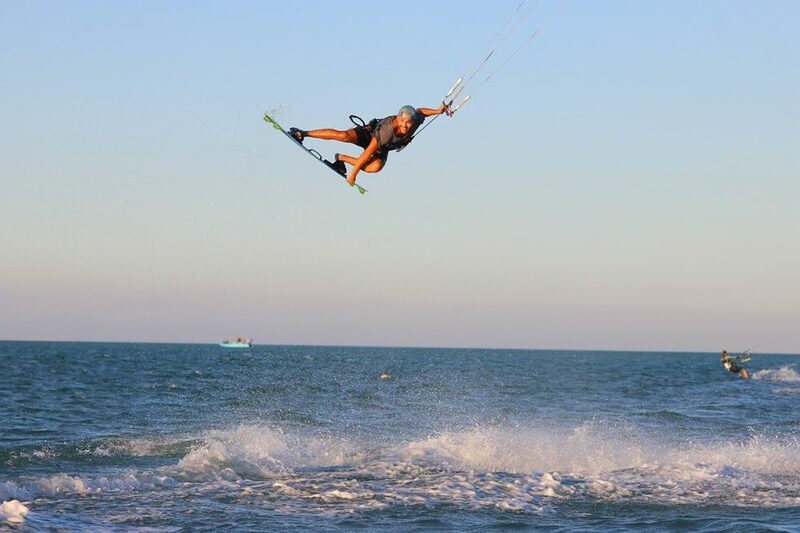 Martina: Tawila is indeed one of the most amazing islands for kitesurfing in Egypt! We do visit it regularly. We arrange daily trips as well as kitesurfing safaris a couple of times per year. That’s another local tip: don’t forget to make the kite safari! It’s a once in a lifetime experience! Amber: Nice! A week-long kite cruise in the Red Sea? I need to get some practice in, so I can join you guys! Gogo: Actually, you don’t need any practice. We have instructors onboard who will give lessons and coaching on the islands for all riders that need or want them. Amber: In which case, count me in! You mentioned you run kiting events. Tell me about those? What’s the difference between an event and normal lessons? Gogo: Normal lessons are basically courses that you book by the hour (strict to the time). We offer 1 hour private lesson or between 2-12 hours group lessons as well. The events are six days in a row, more intense and can include one or two sessions per day. Beginners area with shallow waters. This spot is perfect for getting to grips with basic kite control and body dragging skills. Amber: Do riders need to bring their own equipment or can they rent it? Martina: They can do if they want to, but a lot of guests choose to rent equipment. With events our guests get unlimited use of the equipment outside lesson time, once they are riding independently, which is why the events are more popular. It’s good value for money. Amber: Do all centres here in El Gouna, allow you to rent equipment? Gogo: Yea, I think most of the centres here have equipment you can rent if you can show that you are able to ride upwind. It’s something to look into before you choose a centre as not all centres will have up to date equipment and it makes a big difference when you are just starting out. We are updating our kites regularly and are currently using the latest Duotone kites, which are popular amongst more experienced riders too. Amber: That sounds great. I don’t know anything technical about Duotones kites but have seen them and they do look pretty! Well I think you guys have covered everything. Thank you. I really can see why you love this place. 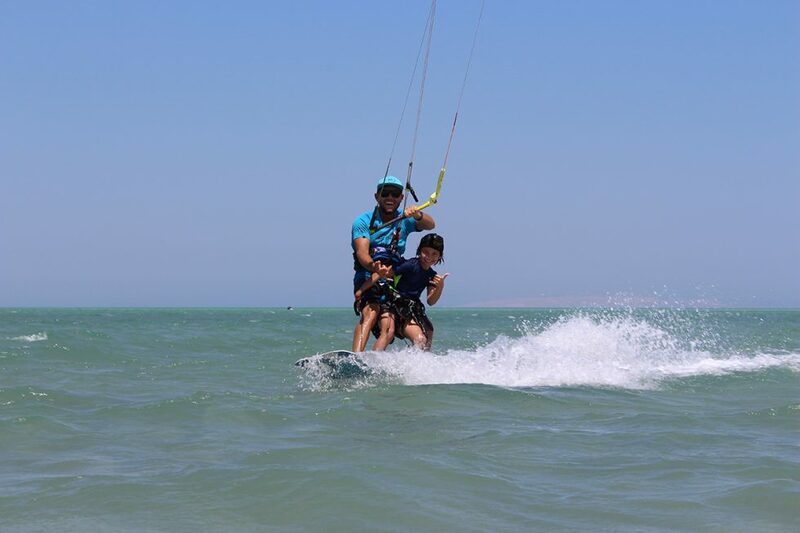 El Gouna seems to have a lot to offer travellers and kiters of all levels. Martina: Any time, thanks for coming, it’s always nice to talk about something we love. Amber: So, shall we head to the water? Gogo: Sure, let’s go get set up! 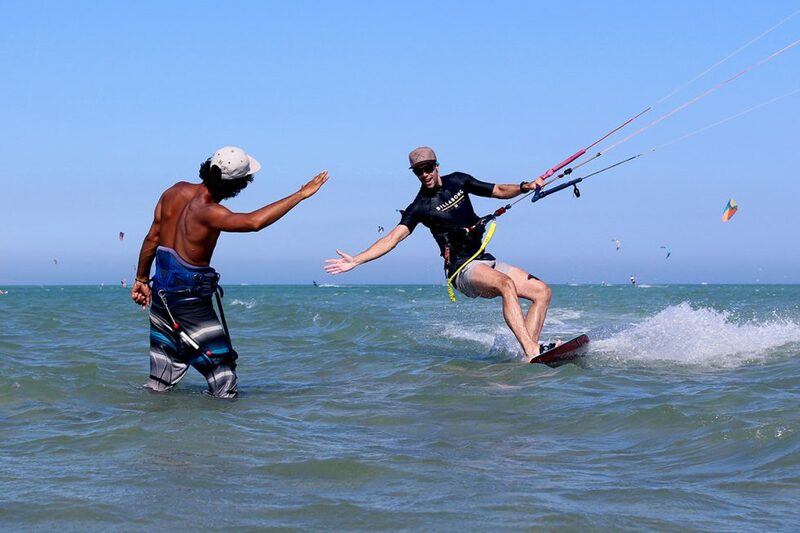 Want to learn to kite with Martina, Gogo and the Nomad Kite Events Team?